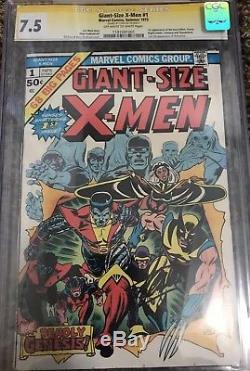 Giant-Size X-Men #1 CGC 7.5, Signature Series, SS Stan Lee! The item "Giant-Size X-Men #1 CGC 7.5, Signature Series SS Signed by Stan Lee! HIGH GRADE" is in sale since Monday, November 12, 2018. This item is in the category "Collectibles\Comics\Bronze Age (1970-83)\Superhero\X-Men". The seller is "poffster" and is located in Nephi, Utah. This item can be shipped to United States.